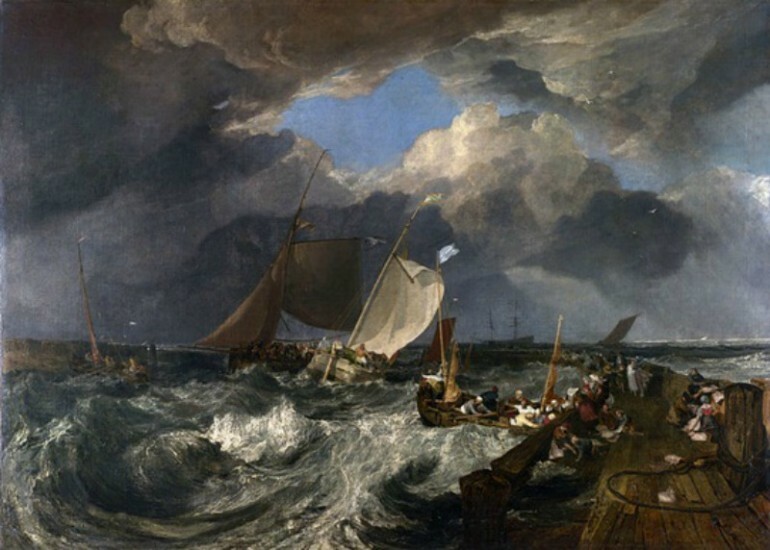 Art critics and historians call John Mallord William Turner, a British Romantic painter, as one of the finest landscape artists. His works had been exhibited since was in his teens. Unlike many of his contemporaries, he was not a starving artist and was very successful throughout his artistic career. He never married and remained devoted to art all his life. More known as J. M. W. Turner, he was born in 1775 in London, England. His father was a barber who taught him how to read. Except for art studies, he received almost nothing in terms of formal education. He worked at home and by age 13 he was already exhibiting and selling his works in his father’s barber shop. In 1790, at age 15 he received the honor of having one of his paintings, a watercolor entitled “A View of the Archbishop’s Palace, Lambeth” was shown at the Royal Academy. It was a rare honor and paved the way for his rise to fame. By age 18 he already had his own studio. Before he reached the age of 20, print sellers were knocking on his door to buy his work to be reproduced. He soon became an associate member of the Royal Academy due to his fine reputation. In 1802, at the age of 27, the Royal Academy awarded him with full membership. Afterwards Turner toured Europe extensively. Turner was a Romantic water colorist, printmaker and landscape painter. During his day he was labeled a controversial figure. Today he is regarded as the artist that brought landscape painting to its great distinction that rivalled history painting. Turner was known for his mastery of water color and was hailed as one of the greatest British painters in that medium. Likewise, he was also a great oil painter. Known as “the painter of light,” it is believed that his work was the precursor of Impressionism. Turner was an artist who made several pencil studies of a scene on location. These studies would later become the basis for his finished work. Many of his early sketches though were exercises in perspective and/or architectural studies. When he was young Turner worked for several architects including Joseph Bonomi the Elder, James Wyatt and Thomas Hardwick Jr. and he also studied topographical draftsmanship from Thomas Malton. Although he showed interest in architecture, Thomas Hardwick advised him to continue painting. One of his most important supporters was Farnley Hall’s Walter Ramsden Fawkes. They became close friends after he was commissioned to paint watercolours of the sea in Otley, located in Yorkshire where the Farnley Hall was. Turner was immediately enamored with the place and visited it regularly. He was also a frequent guest of the 3rd Earl of Egremont, George O’Brien Wyndham. He stayed at the Earl’s Petworth House when he painted the Sussex countryside and the grounds of the house. While on his European tour, Venice became one of his greatest sources of inspiration and he produced some of his finest works there. As was customary to him, he closely studied the effects of the sky and the sea under every kind of weather condition. He trained as a topographic draftsman early in his career, so he had a close understanding of the configuration of surfaces. However his painting technique was one that he developed on his own. He did not only record scenes factually; he translated them into something that was filled with light. When he was still a probationer at the Royal Academy, Turner had the chance to travel around Britain especially in Wales. He continued to exhibit his watercolors at the Academy each year – painting in the winter and traveling in the summer. One remarkable watercolor of Turner, entitled “The Rising Squall – Hot Wells from St Vincent’s Rock Bristol,” was said to foretell the direction his painting would take in the future, with is dramatic and climactic effects. Sadly this painting was lost. 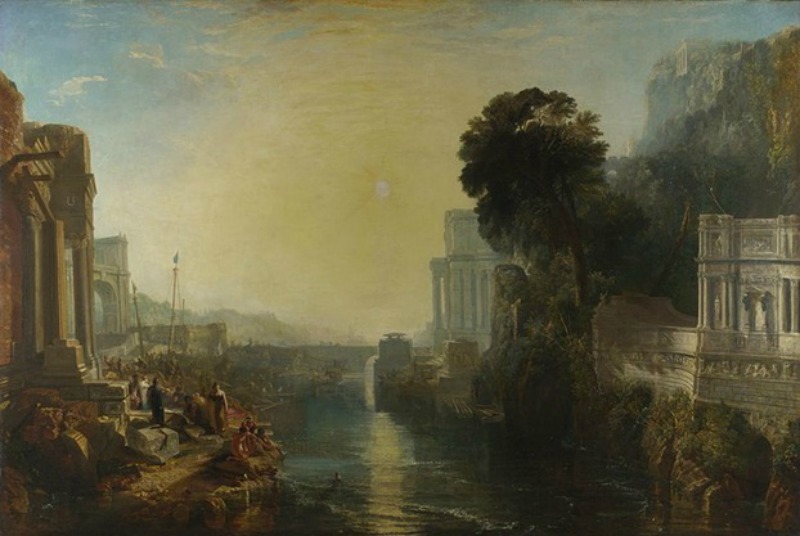 As an artist Turner was recognized as a genius. According to English art critic John Ruskin, he was an artist that could truthfully and stirringly measure nature’s moods. However, as he grew older, Turner became an eccentric. He had no close friends other than his father, with whom he lived for 30 years. He was reclusive and did not allow anyone to see him while he worked. He went alone during his travels and he usually did not like to sell his paintings and would feel dejected for several days if he was persuaded to sell his work. He exhibited for the last time in 1850. He disappeared from his home and cannot be found for several months. His housekeeper found him in a house in Chelsea where he was hiding. He was sick for a long time and died one day after he was found in 1851. His influence reached across to France and the budding Impressionist painters, particularly Claude Monet who studied his techniques carefully. Turner though did not use long-lasting pigments because of his indifference to posterity. He wanted to use materials that looked good when applied freshly, which is now a great concern as his colors are fading rapidly.